Supports IBM PPDS emulation with euro support, EPSON emulation. Bidirectional parallel IEEE-1284 standard and USB standard, internal RS-232 serial option, optional Lexmark N4000e Fast Ethernet, N4050e 802.11g Wireless or MarkNet N7000e Fast Ethernet print servers. Easy paper handling assured by single sheets and continuous forms loaded simultaneously. Standard-yield re-inking ribbon -- prints up to 4 million characters (in Draft mode at 10 cpi). Optional high-yield re-inking ribbon -- prints up to 8 million characters (in Draft mode at 10 cpi). Long printhead life for minimual user intervention Six languages supported in the setup menu: English, French, Italian, German, Spanish and Brazilian Portuguese. Speed: 24 wire, fast draft: 465 characters per second (cps) at 12 cpi. 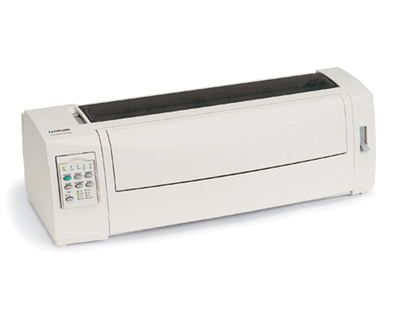 Paper feed speed: Up to 7 inches per second (ips) Prints a wide range of media: 1+3 multi-part forms for 24-wire, plain paper and envelopes. Prints media of numerous sizes: 3" to 11.7" x 5.5" to 22". Prints media of varying thickness: 24-wire: Up to 0.014". Noise level: a quiet 53 dBA (front microphone NLQ mode).